Lobster tails on the smoker are not something that many people have had the pleasure of trying. Sure, its easy to just drop a few lobster tails in a pot of boiling water... but even seasoning in the water won't give you the bold flavor that your smoker can provide. The key tip to this smoked lobster tails recipe is to cut the back of the shell with scissors in order to allow the smoke to surround the lobster meat and provide you with a place to baste your butter mixture throughout the smoking process. Get your smoker up to a temperature of 225 degrees. Then put your smoker wood chips on the smoker to get the smoke flowing. To prepare your lobster tails, cut the spine or the back/top of the shell with a slit that runs all the way down the lobster tail. This will allow you to have a place to baste your butter mixture and also allow the smoke to better penetrate the lobster tail meat. Mix your butter, lemon juice, lemon pepper, garlic, and black pepper in a mixing bowl and place the bowl in the microwave for 30 seconds or until the butter is fully melted. Stir the ingredients together. Set your lobster tails on the smoker with the slit side up for about 45 minutes and baste with your butter mixture about every 20 minutes. After 45 minutes, move your smoked lobster tails closer to your heat source on your smoker keeping the slit side up. 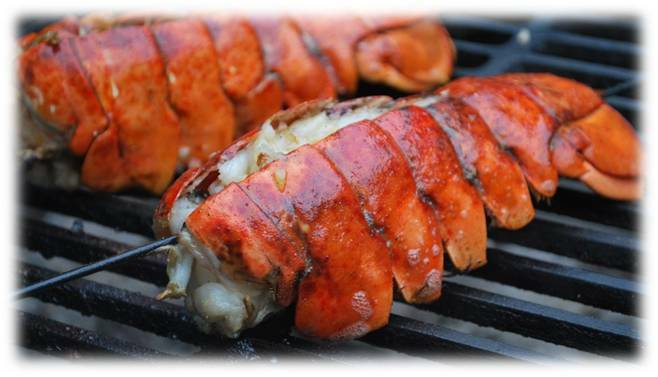 Grill your lobster tails for 2 minutes to ensure your lobster tails are warm to serve. Pull them off your smoker and serve immediately. You can also warm up a couple bowls of butter for those who like to dip their lobster meat directly in butter (optional). Total smoking time should be about 45 minutes for your lobster tails. Remember that all smokers are different depending on the heat source and how far away you position your lobster from the flame.